Dig out those old-school uniforms, if they still fit, and get ready for a fun-filled evening of comedy. John Godber's classic, anarchic comedy about a down-at-heel comprehensive school is being performed in a community setting in Tamworth, Staffordshire, while the town's main theatre remains closed due to major renovation work. 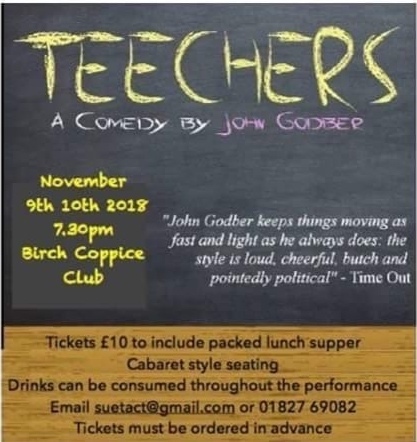 Teechers, a fast-moving and highly entertaining comedy, is to be performed in the Birch Coppice Sports and Social Club in Watling Street, Dordon, in Tamworth, over the evenings of Friday 9 November and Saturday 10 November. 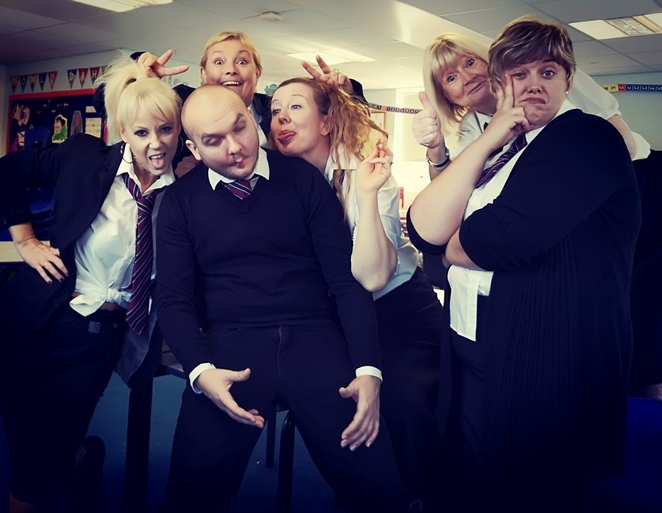 Teechers, which is being presented by the multiple award-winning Tamworth theatre company TACT, has been added to this season's programme of shows and events delivered by Tamworth Borough Council's Arts & Events team. TACT are regular performers at Tamworth Assembly Rooms n the town centre, but are taking their latest production out into the community, with both performances at the Birch Coppice Club starting at 7.30pm. Teechers evokes life in the 1980s at a 'bog standard' comprehensive school. The story describes a new drama teacher who progresses through two terms of unruly classes, cynical colleagues and obstructive caretakers. To help get in the classroom mood audiences will be served a school-style packed lunch during the interval, while and drinks will also be available to purchase from the club bar. Tickets for Teechers are available from the TACT booking office on 01827 69082, priced at £10 each. Tamworth Borough Council's Arts and Events team have a busy programme of events over the next few months. Full information, including ticket details, is available online at: www.tamworthartsandevents.co.uk, or by calling the Box Office on 01827 709618.